Dommard Doan and his horse were heartily sick of each other by the time they reached the inn. It was the end of a long day of riding, which came after several days of riding, in dust and heat and traffic. His swaybacked old mare, sensing his mood, came to a stop and tossed her head a couple of times, as if encouraging him to take his weight off her back. Anyone fleeing Lucrece toward the east or the north would have to pass through this village, Dommard’s employer had said. Given that the man Dommard sought was on foot, he was unlikely to have gone far beyond the place. He might even still be here. Though calling this place a village was generous – the only thing that gave it such a claim was this inn, the only building over one story for miles around. Dommard climbed down out of the saddle and took the reins in hand. The mare shook out her mane with a snort of relief. Thinking of his own aching back and bottom, he couldn’t blame her. Nearing the stable another horse whinnied inside, and his mare answered. A moment later a skinny old man ambled out. “Evening, sir,” he called as Dommard approached. Dommard glared at him. He always seemed to bring out the worst in stable hands. The stable hand made the third coin disappear as swiftly as the others and then bowed. “Very good, sir,” he said, sounding if anything even more sarcastic than before. As the old man led the horse into the stable, Dommard thought he muttered something about tight-fisted Serrishmen. With a sigh, Dommard tied his purse to his belt and went in search of the inn’s front door. He’d seen a thousand places like this, if perhaps not quite so large. The ground level was built of mortared stone, while the first and second stories were half-timbered and painted white. It had no sign over the door, but as the only inn nearby, it didn’t need one. Inside it smelled like smoke, meat and spilled beer, and the hum of conversation carried on unabated when Dommard entered. The most reaction he got was a look from the two farmers standing by the bar, and a rather longer stare from a small, black-haired man sitting with a group of cattle drovers at the opposite end of the main room. There was a woman sitting behind the bar, polishing a glass. She was mountainous and hard-faced, but she greeted him warmly enough when he introduced himself. “Will you be wanting a room for the night?” she asked. “Yes, thanks,” he replied. Reaching for his purse he knocked his bag against the bar, and something twanged inside. These were the words Dommard had been waiting to hear. “Thank you,” he said, feeling like he’d just been fleeced by an expert. It was a common feeling for him here in Tremaire. He slipped the lute back in his bag and slung it over his shoulder. The landlady led him up to the very top level, to a little room with a narrow bed underneath the low-sloping ceiling. It was just as rustic as he’d expected, but at least it was cleaner than the last couple of places. “This is… perfect, ma’am,” he said. She looked at him with a certain measure of pity. When she left Dommard sat on the little bed, whereby he discovered that the mattress was leaking some of its straw. The ceiling was perilously close to his head, too. He wasn’t here for comfort. His quarry had very probably been in the common room. Now that he was alone, he pulled the harp out; he’d find Pier Cantre with it, sure enough, or his name wasn’t Dommard Doan. Pier Cantre noticed at once when the round little man walked into the inn’s common room. Not that he looked in any way remarkable: his clothes weren’t of a particularly rich cut, and he looked like any moderately successful merchant, round-bellied, fat-fingered and balding. But he didn’t seem to be there, which was what caught Pier’s attention from where he sat among the drovers he’d traveled up with. Where Pier could sense the presence of all the people in the inn, as well as the horses in the stables and the rats and insects in the walls, the plump little man was no more than a hole in the fabric of the world. He was a mage-killer, one of those people immune to magic spells. His presence here meant that the Duke of Lucrece wanted to bring Pier back after all. The trip up had been quick and not too difficult. A chant here, a spell there, and other travelers failed to notice him. Earlier today, in fact, he’d joined these drovers, using his songs to make himself unnoticeable to them. That was all over now. As the drovers lowed to one another about all the whores and ales they’d have when they got to the next market town, Pier sat silently, trying not to let the mage-killer notice how nervous and out of place he was among them. A proper mage would have found some way to kill the man. He couldn’t blast him with lightning or use magic to poison him, but he could make something heavy fall on his head or something like that. If nothing else, he might sneak into his room at night and stab him as he slept. But Pier wasn’t a killer. All he wanted was to get out of Tremaire and as far as possible from the Duke in one piece. 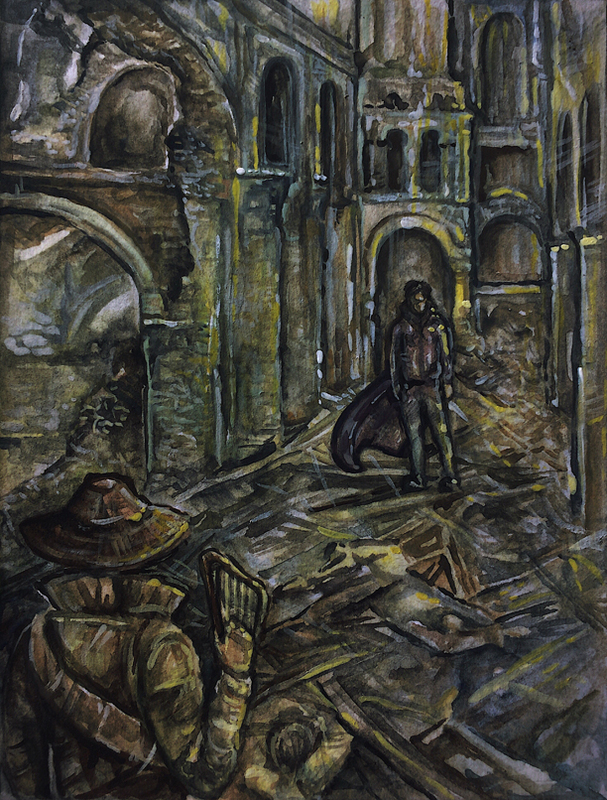 He wondered if the mage-killer would take payment to leave him alone, but this, he had to concede, was a forlorn hope, since the Duke had probably paid the man a lot to avoid that exact eventuality. Pier had the Duke’s money, but he hadn’t taken quite that much. So, what to do? Running away seemed the only option, also because the drovers were beginning to notice, despite Pier’s best chants, that he wasn’t doing very much in their convoy. The one flaw Pier could think of there was that harp the mage-killer carried. That, he’d felt, and not just as a harp; it had waves of power coming off it, like heat off a stove. He’d never heard of a mage-killer with a magic harp, but he had to assume the man knew how to use it, if for no other purpose than to find him. A twang from the bar brought Pier’s head up. The mage-killer carried a lute as well! At least, that was what he could ascertain – a sound like that from a magic harp would have blown the roof off the place. The door slammed open, making him jump. All heads turned toward the men trooping in, a quartet of hard-faced soldiers in blue and gold surcoats with swords at their hips. Pier’s heart sank as he saw the eagle of Lucrece pinned over their hearts. Well, that was that, then. The mage-killer hadn’t traveled alone – once he pointed Pier out for the guards, the game would be up. No sooner had Dommard settled in for a quick nap than a harsh pounding at the door woke him. Two things struck Dommard as he sat up. One was the question of why his employer had sent guardsmen to support him. The other was the beam over his bed. Cursing, he stumbled out of bed and felt his way through the dim room, with nothing but the noise and the sliver of light under the door to guide him. There were two of them out on the landing when he opened the door. From the huffing and cursing coming from the stairs, it sounded as if the landlady was also on her way. “Who are you?” asked the guard nearest the door. The two guards inspected Dommard more closely as if daring him to start singing. “Do you know the mage Pier Cantre?” the one in front asked. Dommard blinked. Something felt wrong here. “Who?” he stammered out at length. “What if I’m the mage-killer?” Dommard asked. Both guards and the landlady looked at him as if he were mad. The three of them left without another glance at him, but Dommard stood in the doorway a moment longer, thinking. Ennerin hadn’t said anything about sending guardsmen to support him. And, judging by the two who’d rousted him out of bed, these were hard men indeed. There was no reason to suspect he’d make it back to Lucrece if he revealed himself and let them accompany him back. It wouldn’t be the first time a patron had tried that. Dommard went back in and gathered his satchel with his instruments. He also dug into his saddlebag for the knife. This he hid within his sleeve. Always a good thing to have in reserve. When he got downstairs the two guards who’d knocked on his door stood at opposite walls, eyes scanning the crowd. Another guard stood by the door, and a fourth man, with a sergeant’s eagle on his breast, stood at the bar. The landlady sat across from the sergeant, her nerves clear as she glanced up at him every few seconds from her polishing. “Who are you?” asked the sergeant when Dommard approached. The man’s bearing suggested aggression and stupidity that would have seemed excessive in a bull. “Why, that’s the minstrel I told you about, sergeant,” said the landlady from behind the bar. Dommard smiled encouragingly and pulled out his lute. “You’re far from home, sergeant,” he said, trying to be friendly. This was a mistake. Eyes wide, Dommard stepped back. He’d expected laughter from the other guards, but when that didn’t happen, it just confirmed that these men were up to no good. “My apologies,” Dommard said, and slunk over to an empty table, feeling the gazes of everyone in the room on him as he sat. The sergeant, for his part, turned back to his tankard of ale and the business of giving hard looks to everyone in the room. Dommard cursed to himself. It was Cantre. Dommard looked around. Whatever interest he’d aroused before, nobody was paying attention to him now. The only person who could see the mage was Dommard himself since the spell didn’t work on him. The mage inclined his head, his smile forced. “He’s not the most trusting, is Duke Ennerin,” Dommard replied. He rose and walked to the door, still unnoticed. The guard beside the door even looked right at him, but his gaze just slid past. He gave the word “harp” a strange inflection, and something went twang inside Dommard’s bag. The common room burst into life as the landlady shrieked, and the soldiers all perked up to see what was going on. Pier gave Dommard a rueful smile as he opened the door and walked out. When Dommard pulled the lute out of his bag all of its strings had snapped. Forgetting himself, Dommard rose to follow the mage to the door. At once the soldier beside it placed himself in Dommard’s path. “He just left, you idiot!” Dommard snapped. Once again, this turned out to be the wrong thing to say. Faced with a pudgy little musician berating him for unknown reasons, the guardsman resorted to what he knew best. He backhanded Dommard across the face, knocking him into a table and adding to the confusion. Everything went black. Dommard woke up propped against the far wall of the common room. He couldn’t have been out long, because it was still dark outside and the landlady was shouting at the Lucrecian sergeant. He felt a bit better when she yelled something about “beating up the entertainment”. That changed when she realized he’d woken. He must have made a sound or moved or something because she came over and started tugging at his arm. Dommard struggled to his feet, the world beneath him turning woozily. The guardsman who’d hit him stood watching as if daring Dommard to try another dashing escapade. “Let me get my bearings please, good lady,” Dommard said. “Here they are, your bearings, just up here,” she replied, guiding him to the stage and its little stool. When he was safely perched upon the stool, he looked back in his bag. The lute was broken, sure enough – he hadn’t brought that many spare strings that he could replace them all, and besides, it would take too long. Dommard thought for a moment. There was a trick to playing the harp without knocking the inn down, and when he was able to concentrate it even sounded quite good, but he didn’t think he was in any condition for that. He cleared his throat. Everybody looked at him with expressions ranging from distaste to active loathing; he didn’t blame them since they were literally being forced to listen to him. He was going to make Duke Ennerin pay for this, and handsomely. “This is an old tune from my homeland, the Serrish,” he said, at last, pulling the harp from his bag. And he began to play. The trick to playing the harp without wreaking havoc involved bending the notes to dilute their normal effects and playing notes out of the normal sequence of eight. He’d studied with a master mage for a year to perfect this style, but the problem with it, as his unfortunate audience was discovering just now, was that it wasn’t what you would call tuneful. Dommard himself couldn’t feel it, but whatever energy he was releasing was shaking dust from the rafters. He played for as long as he thought a traditional drinking song might last (or just a little less). By then, everyone in the common room, from the landlady on down to the guardsmen, had their fingers in their ears and a look of pained bewilderment. As the last note died away a horse shrieked outside, underlining the disastrous experience. When it looked like no more music might break out, the landlady rushed the stage and began dragging him off. “I thought you said you played,” she hissed in a stage whisper. It was all going from bad to worse. He was about to protest when the door slammed open again, and four more guardsmen, wearing the King’s own livery, marched in, leading a very embarrassed looking Pier Cantre along. It had been going so well. Better, in fact, than anything had gone for him since he’d left Lucrece. He’d managed to free himself of the drovers and escape from that mage-killer, all without being noticed. He didn’t have any food on him, and his money was running low, but he hadn’t had to hurt anyone in the process. The Plain of Tremaire, and the road to safety was just ahead. And then these men had found him. Their golden cloaks marked them as officers of the Tremairish king, something that occurred to him just as he blundered into their midst. There was a confusing moment where he wondered how they knew he was there until he remembered that he wasn’t singing his invisibility spell anymore. That moment let them drag him to the ground, and one clapped a hand over Pier’s mouth to stop him chanting. Pier should have known that King Maurin would have heard about his escape by now. An escaped mage was valuable property indeed. Pier let out a breath. Struggling any further would avail him nothing, so he didn’t resist as they stood him up, clapped iron manacles on him and marched him right back toward the inn. He spent the walk trying to think of his next move but to be honest, thinking under pressure had never been Pier’s strong point. His best ideas came to him with quiet study and reflection, perhaps even a spot of prayer. The decision to leave Lucrece and start afresh, for example… although, on second thought, that wasn’t proving to have been such a clever idea after all. And as promised, the iron was buggering about with his magic. Whenever he tried humming something to turn invisible again, the guard captain would cuff him. But the pain really started when they got back within earshot of the inn. It wasn’t just the music, divorced as that was from any concept of melody. There was a feeling like a storm brewing all about the inn, but it was a storm with no outlet. Every time it threatened to break free, another improbable sequence of notes would wrap it back in on itself, making the pressure even worse. This was what happened when you gave a magic harp to a mage-killer. “Are they murdering a cat in there?” asked one of the Tremairish as they approached the front door, the final notes dying away. A horse shrieked from the stable. The captain walked up and slammed the door open. Inside everyone sat facing the stage, some with their fingers still in their ears, while the landlady led the shame-faced mage-killer away. The four Lucrecian guardsmen were still there. That made the Tremairish soldiers stop dead. The king of Tremaire and Duke Ennerin had never been on the friendliest terms. “What are you lot doing here?” the captain asked. The Lucrecian sergeant’s face clouded over, as he saw Pier. Pier looked up and caught the mage-killer’s eye. The man was as bewildered as he himself was. Things between the soldiers were getting tenser, and the magical energy roiled around him, feeding off the emotions. It was perhaps the rashest decision of Pier’s life, and in normal circumstances, he would have been uncomfortable even talking with that maelstrom of energy seething all around him. He pursed his lips and whistled a rising note. Clearly, Dommard thought as he picked himself out of the wreckage of the inn, his harp playing needed some work. Otherwise, Pier Cantre whistling like that shouldn’t have been enough to give someone a runny nose, let alone blow the roof off the way he had. The mage still stood in the middle of the common room, although with the walls knocked down it wasn’t really an inn anymore. Pier was unhurt if a bit stunned by the scope of the devastation. “Nice trick,” Dommard said, his ears were still ringing. The mage started and looked at him. He looked about to say something, but instead, the air went out of him. “Looks like you’ve caught me after all,” he said. “That idea had occurred to me,” Dommard answered. He looked around. The tables and chairs and patrons had all been blown over and beyond them, three of the walls. Only the part attached to the stable still stood, with the stable hand cowering behind it. Groans rose from the survivors, but no one looked like getting up any time soon. “Why didn’t you just kill me when I walked in?” he asked Pier. The man looked at Dommard like he was an idiot. Dommard stood there a while longer. At last, he shook his head and bent down to get the keys to the manacles off the Tremairish captain’s belt. In a moment he’d freed the wide-eyed mage. “So, he’s dead?” Ennerin asked, looking at the ring in his palm. “Deader than dead, your grace,” Dommard replied cheerily. They stood in silence for a moment longer, Ennerin brooding on his throne and Dommard standing below his dais. After the quiet had stretched, Dommard cleared his throat. Ennerin straightened as if he’d been hoping Dommard wouldn’t bring that up. “No?” Ennerin’s voice echoed sharply in the wide, high-ceilinged room. Ennerin stared at him in pure loathing. It made the duke look like a vulture. At last, though, the old man croaked out a bitter laugh and sat back. When the riverboat pulled into the harbor at Ursen, the capital of the Serrish, Dommard found Pier Cantre waiting for him. “How did it go?” the mage asked when Dommard had disembarked. “Sir, you don’t think the Japanese attacks and the murder are somehow connected…do you?” For the first time ever, and I do mean ever, the man smiles, revealing a wall of perfect white teeth.